I have learned that one can find God in all things, even anime. In this entry, I would like to explore the relation between Christology and anime. After WWII, Japanese culture was highly influenced by American culture. In the 1960s, Japanese artists adapted and simplified the “Disney” style animations they saw at the movies and used them to tell Japanese stories. In the 1980s, the popularity of manga, the comic-book form, skyrocketed and the process of animating manga series as TV shows became big business; making titles like Dragon Ball Z familiar to westerners. Anime is known for its distinctive artistic style, its use of cartoons to convey serious literary themes, and frequent appeals to the zany, the magical, or the metaphysical. For Westerners, Japan was the final frontier. Traveling from Europe to Japan in the 16th century was the equivalent of traveling from the earth to the moon today; except space travel is a bit safer. Travel by ship carried enough risk of disease, malnutrition, pirate attack, and shipwreck that missionaries had about a 50/50 chance of making it alive to Japan. What religious order would be foolish enough to take on odds like that? You guessed it: the Jesuits. St. Francis Xavier, the great Jesuit missionary, arrived in Japan in 1549. Christianity enjoyed great reception in Japan, especially among peasants, until it was outlawed decades later by the shoguns, who rejected all things foreign. A few underground churches survived but Christian culture didn't gain much traction in Japan until after WWII. The lasting contributions of American Christianity to Japanese culture are Christmas and weddings. Since the arrival of Christianity to Japan, the Japanese have appropriated general Christian symbols in order to explore a theme. These symbols convey emotions and a subtext of meaning. The symbols might be images of the cross, death scenes that resemble the crucifixion, angel wings, resurrections, etc. You can find examples of the simple use of Christian symbols everywhere: good characters may be drawn with halos or angel-wings; evil characters with names like “Kururo Lucifer” or “Gamora”. A good example of more complex symbolism is the Christian imagery in the 1980s anime series Evangelion. The author is not interested in exploring Christianity, angels, or scripture. He is however interested in using these symbols to represent aspects of the story he wants to tell about human nature. When an explosion happens in anime, there is often a column of fire. 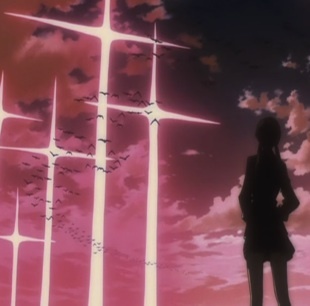 In Evangelion, an explosion that occurs when an enemy alien dies is topped with a horizontal line, making a cross-shape. The author is using the symbol of the grave. But the death of the aliens is not a simple victory. The protagonists are torn by the necessity of killing other creatures to ensure humanity's survival. The cross evokes the sacrifice of one celestial life to preserve the lives of sinners. So the Christian symbol helps the author convey and explore themes of his story. Another phenomenon, although less common, is that of characters who are explicitly Christian. Professed Christians are rare, though not unheard of, in Japan, and so they are rare in anime. Such characters are almost never protagonists. They are usually a bit inaccurate, mythological, or exaggerated. They represent the exotic and the foreign in the story. One example is from a show called Saint Tail. The drama of her show centers around a high-school girl who is secretly a notorious cat-burglar. The Christian character is a 14-year-old nun-in-training called Seira Mimori. Mimori, is the close friend of the heroine; and ends up hearing her confessions. The show doesn't really explore any themes of Christianity and, as you can tell, doesn't quite capture the essence of the sacrament of confession. The Christian character's Christianity simply serves to reinforce her role in the story as a representative of the good and juxtaposes the heroine's dangerous double-life walking the line between law and crime. Christian characters can also represent cultural outsiders. A good example of this is Fr. 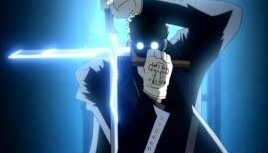 Anderson from the anime Hellsing. Anderson is a priest secretly employed by the Vatican to hunt vampires. Awesome enough to be the hero of his own show! But he is not. He is actually an antagonist, because the hero of the story is a Vampire who helps humans. Anderson represents an uncomprehending foreigner: while he has ideals and honour, these very traits lead him into conflict with the protagonist. Christianity is exagerated and used to convey the exotic. In these cases, Christianity is used to explore the story. But there are rare cases when the story is used to explore Christianity.